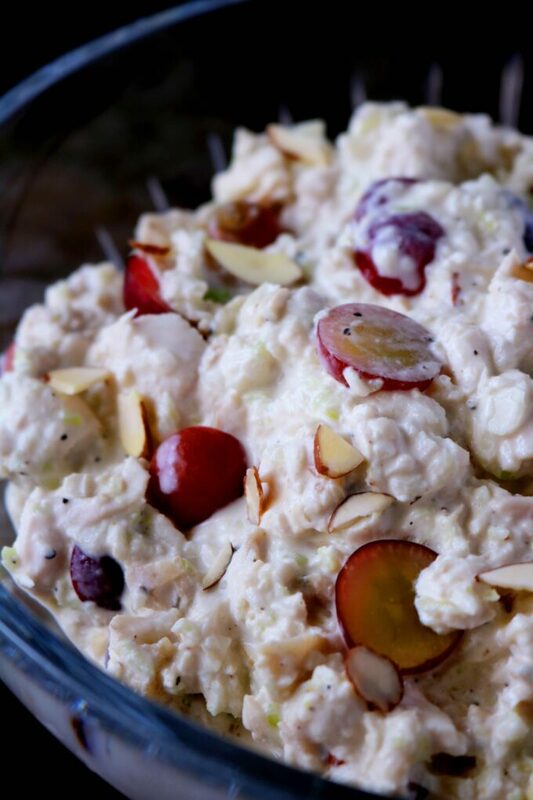 An easy and simple chicken salad with grapes and almonds to fill up your chicken salad sandwich! Featuring a traditional chicken salad recipe with the perfect spreadable consistency thanks to a little kitchen technology. Chicken salad is a simple mixture of chopped or shredded chicken and finely diced vegetables (usually onions and celery) and is finished with a simple mayonnaise-based dressing. Many versions are spruced up via the addition of simple add-ins like nuts and fruit, the most common being grapes and almonds. WHAT IN CHICKEN SALAD DRESSING? As mentioned above, Chicken Salad dressing is mayonnaise-based. It gets a tangy note from a touch of dijon mustard, a hint of sweetness from sugar, and of course, salt and pepper. To make the dressing, all you have to do is combine the ingredients in a bowl and stir. In this recipe, technology does the brunt of the work for you, making this one seriously easy, quick dish to make. Using a food processor not only cuts back on the prep time, but it also breaks down the chicken to a perfectly spreadable consistency. Add onion and celery to food processor fitted with blade attachment, and process until finely minced. Add diced chicken and process until broken down and spreadable consistency. 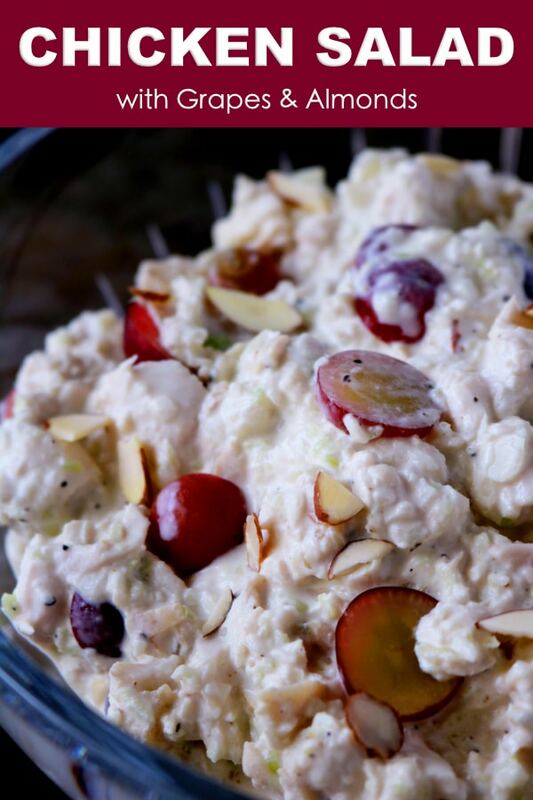 Make dressing, add chicken, grapes, and almonds, and mix well. The whole process starts with roughly chopped onion and celery. Throw them in the food processor and give ’em a whir. Hunks of chicken go into the food processor with the vegetables, and all that is left is to whisk up a sweet and tangy dressing and add it to the mix. 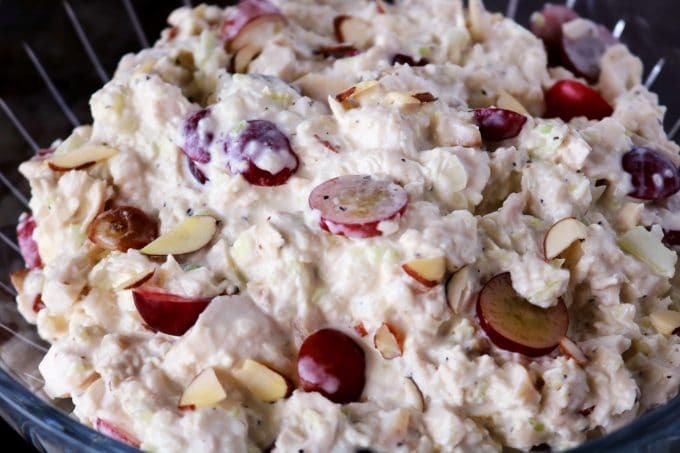 And, if you’d like to add a little oomph of flavor and texture to the chicken salad, fold in some grapes and almonds, and call it a day. Rather than having to shred the chicken, the blade attachment of the food processor does all the work for me. Plus, it creates the perfect consistency for our chicken salad. The food processor makes quick and easy work of whipping up chicken salad. But if you don’t have one, you can certainly still make this recipe. You would simply need to mince the vegetables by hand, and rather than letting the food processor break down the chicken, shred it. The texture won’t be identical, but the flavor will most definitely still be on point. 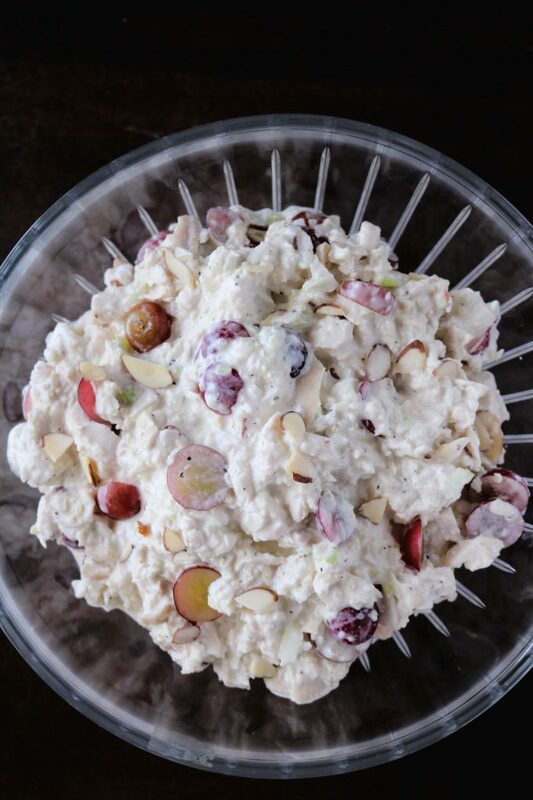 Whether you are serving it as a quick-fix lunch of your own or stuffed in mini croissants as a beautiful brunch course, you can count on this recipe for Chicken Salad with Grapes and Almonds for perfect results every time. If you’re looking for more sandwich ideas, you might want to try this smoked salmon and cream cheese spread perfect for tea sandwiches, chopped turkey salad absolutely ideal for using up turkey leftovers (but totally worth roasting up some turkey cutlets any time of year), or the Southern classic, Pimento cheese spread. Enjoy! 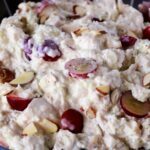 An easy and simple chicken salad recipe to fill up that perfect chicken salad sandwich, featuring shredded chicken, sliced grapes, and crunchy almonds. Add the onion and celery to the bowl of a food processor fitted with a paddle attachment, and process until minced. Cut the chicken into 1" chunks (should have between 3-4 cups), add to the food processor and process briefly until the chicken is fine in texture and the mixture holds together when pinched. In a large mixing bowl, whisk together mayonnaise, dijon, sugar, salt and pepper. Add the contents of the food processor to the mixing bowl, along with sliced grapes and almonds (if using). Stir to combine. Serve right away, or refrigerate for 3-4 days. This salad is my mother in law’s favorite. Now that she is in the nursing home I bring her this and makes her so happy. I do not use dijon though I might start adding some is a good flavor contrast. This looks really easy to make, and still brings that comfort to the table. I love everything with mayonnaise, so this chicken salad must be perfect for me! Having two kids, I like using a food processor as it speeds things up in the kitchen so I will have to give this chicken salad a go! A long time ago, I had a crepe dish that had chicken and grapes. I thought it was the most amazing dish ever. The flavours in this recipe remind me of that dinner. This sounds like something my family would love. I’ve never used a food processor to make chicken salad, but that is such a great idea! I can’t wait to give it a go. I must admit chicken salad is something we do not have often. I love how easy it is to make this dish. All of the great flavors added. I am sure hubby and the kids will enjoy this. 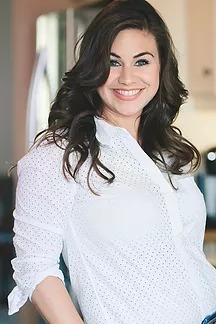 Will give you recipe a try. I love quick salads like this one that I can whip up for my family. Chicken salad is always a favorite in our home. This one looks absolutely delicious! I love grapes in my chicken salad! This looks amazing for one last summer picnic!